Owned and operated by Asbestos & Environmental Surveys Singapore Pte Ltd. The Workplace Safety and Health (WSH) Council and Ministry of Manpower (MOM) have released new & enhanced regulations for work involving asbestos, a substance that is known to cause lung cancer. 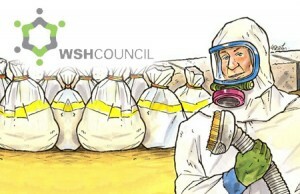 The WSH (Asbestos) Regulations will replace the existing Factories (Asbestos) Regulations and take effect from May 1, 2014. Under the new regulations, a competent person must be appointed to ascertain if asbestos-containing materials are present before commencement of demolition or renovation works on buildings built before Jan 1, 1991. To be deemed a “competent person”, you must be a licensed asbestos assessor under the new criteria as from May 1, 2014. Once the Asbestos Register has been completed and ascertaining that asbestos is present, asbestos removal work can only be done by an approved asbestos removal contractor under the supervision of a competent person. This will protect workers and “prevent the release of asbestos fibres into the air which can also affect the public. The regulations also specify the technical requirements regarding the removal and disposal of asbestos-containing materials. Asbestos & Environmental Surveys Singapore (AESS staff are, licensed asbestos surveyors, licensed asbestos removalists and are able to manage all aspects of asbestos work in Singapore. Our trained and licensed asbestos Surveyors will attend the property and conduct a detailed survey of the property. This survey will include the taking of samples for laboratory analysis to determine the presence of asbestos. Once the survey is completed and the laboratory analysis is returned, AESS provides the client with a detailed asbestos register. The register identifies all asbestos issues, their location, the type of asbestos and a condition assessment. AESS specialist are able to create a detailed Asbestos Management plan that conforms to all the Government requirements for the Safe Management of Asbestos. The AESS demolition Survey and report is the exact same as the Asbestos Survey, however we also include a detailed Safe Work Method Statement and the relevant Draft document of the Removal plan. The removal contractor will complete the remaining aspects with regard to the plan. If your property of company is undertaking an asbestos removal project, AESS surveyors and specialist are able to oversee or manage the removal process by ensuring that your contractor follows ALL the requirements of the Regulations relating to Asbestos Removal. This ensures that you are protected against any possible future legal action. Copyright 2014. All rights to website & its content are reserved by Asbestos & Environmental Surveys Singapore Pte Ltd.